Tom rides the choppy waters of the Presumpscot on his SUP. The 28-mile Sebago to the Sea Trail begins at Sebago Lake and ends at Casco Bay, following the the Presumpscot River, and crossing a number of trails in the Portland Trails network. The idea for the trail was originally hatched by the Presumpscot River Watershed Coalition. In 2007, Presumpscot Regional Land Trust (PRLT) carried the idea forward and established the Sebago to the Sea Coalition with the goal of completing an end-to-end trail. Members of the coalition included Portland Trails, the Bicycle Coalition of Maine, the cities of Portland and Westbrook, the towns of Gorham, Falmouth, Standish and Windham and the Maine Department of Transportation. The first 8.5 miles of trail were established in 2010. Today, you can walk about two thirds of the route on trail, and the hope is to someday complete an end-to-end trail passage. But a group of friends and I had a different idea: we wanted to paddle all the way to Sebago to the Sea on our stand-up paddleboards (SUPs).We had heard of a few kayakers who attempted the Sebago to the Sea voyage, but to the best of our knowledge, nobody else had attempted it by SUP. So, at six o’clock on a crystal-clear July morning, I found myself with six friends scurrying across Route 35 in Windham. We chose to launch in the Eel Weir Canal, a flat-water canal that connects Sebago Lake Basin to the the Presumpscot River and allowed us to avoid the un-runnable whitewater that makes up the first mile of the Presumpscot. Presumpscot means “many falls” in the Abanaki language, and while many of those falls are under or changed by dams, the river still felt remote and wild. Much of the time it was hard to tell we were close to the largest city in Maine. The trip involved nine portages around eight dams and one waterfall. These portages—or places where you need to take your boat out of the water—were established by the coalition and made the trip easier and safer. We covered the first few miles with ease, I was glad I had scouted the portages ahead of our trip to avoid snafus on paddling day. The portages ranged from a quarter mile to three-quarters of a mile in length, which by the end of the day adds up to a lot of hoisting and hauling your board. We made our way through the flatwater sections of Windham and Gorham, finally arriving in Westbrook. This is where things got interesting. The first Westbrook portage was the Saccarappa Dam–a half mile right through downtown Westbrook. The way people were looking at us you’d think nobody had ever walked through town carrying SUPs before. And honestly, they probably hadn’t. 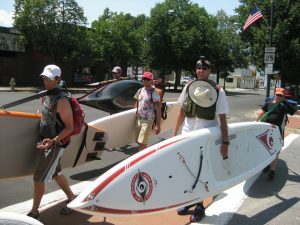 Tom and his friends carry their SUPs through downtown Westbrook, a sight to see! A short paddle through Westbrook brought us to the mother of all portages: Sappi’s Cumberland Mills Dam, a solid three-quarter mile slog on pavement and then a bushwhack through what seemed like a small jungle. I had visited it a few days earlier and the gentleman in the guard booth confidently assured me the portage was “over there”. They even had it on a map so I figured he had to be right. When we had to do it for real though, the portage proved to be an almost impenetrable thicket of thorns and brush. We tumbled through, and faced a relatively clear (save a branch or two) run to Presumpscot Falls, the last portage. Luckily, this portage, right along Portland Trails Presumpscot River Preserve, was well labeled, well maintained, and very, very short. Once below Presumpscot Falls we were in tidewater, our official end to the trip. We pulled our boards out at Walton Park in Falmouth, exhausted and triumphant, we’d made it to the sea. For hikers, the official Sebago to the Sea trail leaves the river above the falls and shares some of our well-known trails on its final leg to the water, ending at East End Beach. Of course, you don’t have to paddle the entire river in one day, the Sebago to the Sea Trail makes it easy to access much of it for shorter trips. 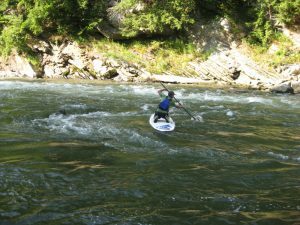 There are lots of calm river spots for beginning paddlers to learn and explore without scrambling through brush or carrying your board through traffic. Check out the maps at sebagotothesea.org or at trails.org for the locations of parking spots and trails along the river. (On Portland Trails map, the Sebago to the Sea Trail is highlighted in pink.) The ability to get out and enjoy rivers like the Presumpscot is what’s so great about coalitions like Sebago to the Sea. It’s not just about the trail itself, it’s about getting more out exploring the natural wilderness and encouraing involvement with stewardship and conservation of our precious land and water.